It’s Side Bet Monday at William Hill Live Casino. But you’ll need to be quick if you want to take part in this promotion as it’s only available Today (13th February 2017). If you place at least 10 Side bet bets and you don’t win you’ll get back a 20% Bonus on your losses up to £50. This has 5x Wagering on it. Live Blackjack – 21+3 & Perfect Pairs. Baccarat – Banker & Player Bonus, Banker & Player Pair and Perfect Pair. 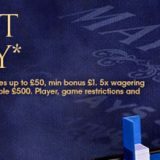 Caribbean Stud Poker – 5+1 Bonus. Casino Hold’em – Aces or Better. Three Card Poker – Pairs Plus and 6 Card Bonus. Vegas Ultimate Texas Hold’em – Trips. You have to OPT-IN to the promotion to be eligible for the bonus. The Bonus comes with 5 x wagering. All Live Games contribute 100% except Live Blackjack and Baccarat where it’s 50%.